What you see when you’re passing the corner of Elm and queen in Albany. It was last Aug. 21 when I wrote about this restaurant, which had been vacant and closed for so long that a reader had asked me what was going on. The owner, Ed Wright, told me he hoped to open it soon. Then, on Monday, back in town after a week away, I’m driving around in search of a meal when up out of the night pops this vision of an old-time diner. 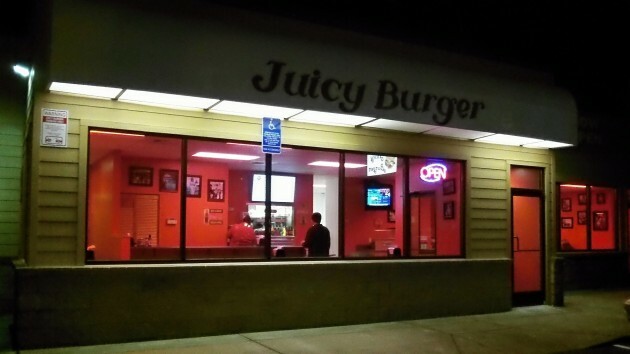 Turns out that the Juicy Burger actually opened Dec. 2, but without fanfare, or with so little fanfare that it went over my head. On Jan. 11 there was a story about the newly opened place in the Democrat-Herald, but as fate would have it I was out of town then too and didn’t see it. So here I am on Monday night, driving along and thinking of tacos or something after sitting through a two-hour city council work session, having managed to stay awake through one Power Point slide after another. I’m thinking of tacos or something and heading for Pacific when, at the corner of Queen and Elm, I see this rosy glow where I’m accustomed to seeing nothing at all. I stop and go inside. 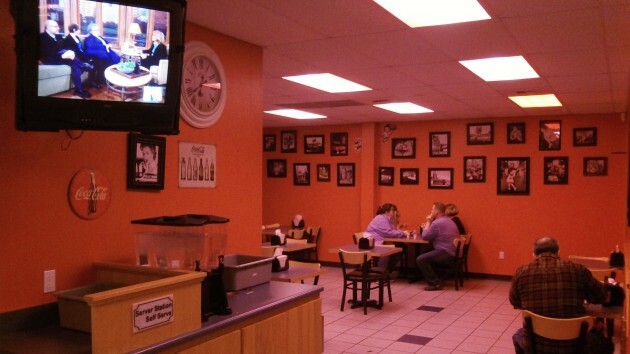 Sue enough, the décor tends toward red, and there is a counter with round stools, just like in the diners of old. There’s a dining room with tables too. But for me counter it is. The interior décor has a decidedly reddish tint. The menu is brief and to the point. Burger and fries. That’s pretty much it. Oh, there’s soft ice cream too, rounding out all the essential nutrients. The basic burger is $3.50. If you want the luxe version with lettuce and stuff, it’s more. My basic burger was pretty good, I must say, even without the extras. And yes, juicy too. I’m reporting on this mostly to close the loop that I opened with the entry last August: The long-awaited burger joint is open. The employee behind the counter tells me they’re open from 11:30 to 7:30 Monday through Saturday. So you can try it out yourself. Great to see a “new” business occupying a long vacant site. Been there, ate there. Not bad at all. Made from scratch burgers, NOT assembly line stamp outs. Sure beats the “factory burger” joint a few blocks east. Probably as business grows they might expand the menu. Thanks for the “heads up”. Gotta try this out next time I’m in Albany and hungry. Why would you close at burger joint at 7:30? Especially one right next to a high school, with numerous events ending after that time. Interesting, especially the comment/review by fishface; some of the other comments may just be trolling. What seriously bothers me is the pretense of “healthy,” much repeated in the article. I can’t tell how facetious is Hasso’s comment “””Burger and fries. That’s pretty much it. Oh, there’s soft ice cream too, rounding out all the essential nutrients.””” Seems that soda should be added to his list. Add it up and what you get is a lot of sugar and other “fast” carbs, probably a lot of saturated fat, too much protein if this isn’t your biggest meal of the day, too much sodium (especially with the mandatory ketchup and pickles), and almost no fiber or any of the myriad poorly-understood components of the vegetables and fruits that serious nutrition science puts at a high priority for good health. On the other hand, the article mentions avoiding “products with GMOs – which wasn’t easy.” There may be many good environmental, philosophical, and economic reasons to oppose GMOs, but unlikely any health reasons. By the way, the top photo reminded a little of Edward Hopper’s famous painting – until I looked at it again (my memory of colors is very poor). I meant the top photo on this page, not in Ray’s linked article. I wish Juicy Burger all the best, and am thrilled to see a business in a spot that has been closed for so long. That said, I tried to order there but was really disappointed by their one-way-only policy on their burgers. Personally, I really, really don’t like ketchup, and I am quite unlikely to order a burger if I am forced to have ketchup whether I like it or not. Seems like an odd thing to draw such a hard line on. If you happen to go by again I would encourage you to try it out! I also am not really a ketchup person, and never put them on my burgers, but I really didn’t even notice it. I got the deluxe cheeseburger and it was honestly fantastic. I do wish they would be more flexible; maybe they will do that in the future! !